The GL is 5,088mm long (16’ 9”, in English). It’s also 1,920mm (6’ 4”) wide before you close the door mirrors and 1,840mm (6’ 1”) high without being risen on the air suspension. It’s a lot of car. And sits on huge standard 18” wheels with 265/60 R18 tyres or massive 19 inchers with 275/55 R19s. Engines for the UK are a 224PS 3.0 litre V6 diesel, a 306PS 4.0 litre V8 diesel and a 388PS 5.5 litre V8 petrol. The 4.0 litre V8 diesel is a new engine. 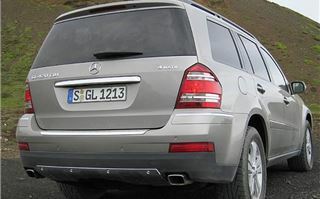 Other markets also get a new 340PS 4.7 litre V8 petrol, All feed their power to the 4MATIC four wheel drive system via Mercedes 7-speed 7GTRONIC automatic transmission, and all have AIRMATIC suspension that enables you to raise the height of the body in three stages according to the severity of terrain you are asking the car to tackle. Kerb weight is a substantial 2,430kg to 2,550kg, allowing a braked towing weight of 3,500kg. Though only a foot longer than the 4,780mm ML it feels a much bigger vehicle. You’re aware of that as soon as you climb aboard. It’s also squarer at the front, with less of a rake to the screen. 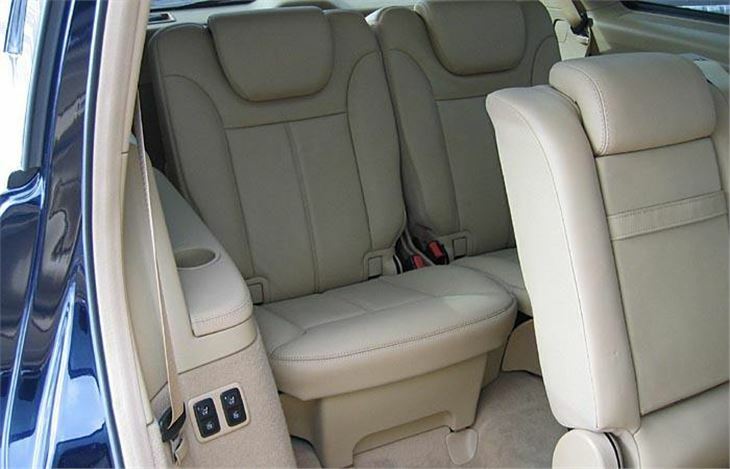 And it’s an honest 7-seater. 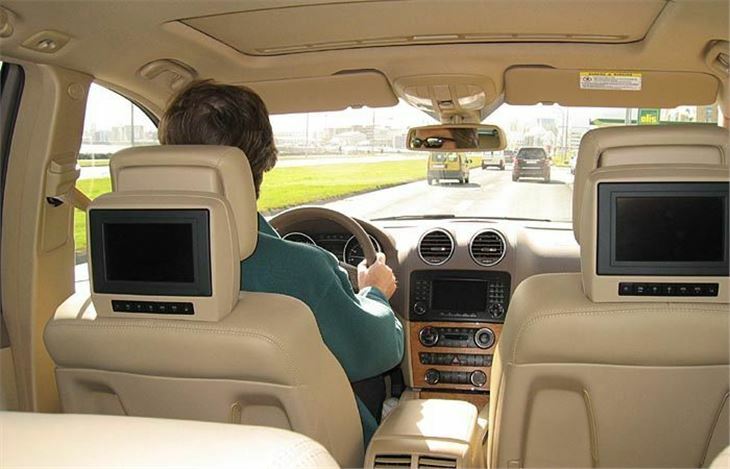 I actually spent twenty miles in one of the rearmost seats and would have been happy to spend 300 miles there. 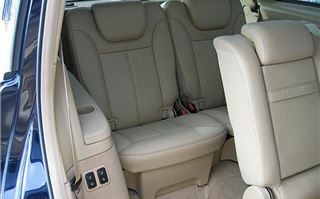 The ride quality, the shape of the seat, the legroom, the toe-room under the seat in front, the sunroof above and the view forward between the three head restraints in front of you all help to make it a very comfortable place to travel, despite being located right over the rear axle. There is about 18” of luggage space behind (300 litres), but if you want to carry stuff instead of people, the seats automatically fold at the press of a button. 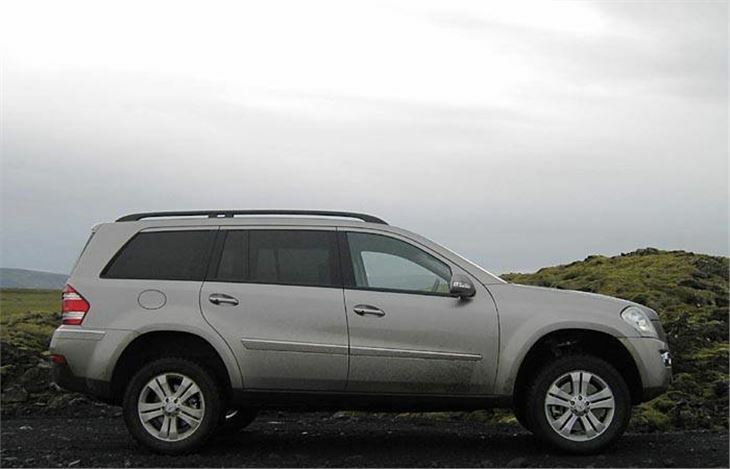 We drove three versions, the 420CDI, the 500 and the 320CDI over a variety of roads, terrain and even rivers in Iceland. As with all latest generation 7GTRONICs the transmission is not only very co-operative, it’s a doddle to drive. A little lever on the steering column selects Drive, Neutral, Reverse and Park. This helps enormously with three-point turns because all you have to do is move the lever either up or down to select forward and reverse from each other. To put it in park you merely press the end of the lever. It has the same 7GTRONIC shifter toggles behind the steering wheel as the ML and SLK. Forward gets a lower gear. Back gets a higher gear. You can do this in manual or automatic modes, selected by a button on the console, but manual locks it in whatever gear you have selected until you change. For off road use, the two dials of the same standard ‘Off Road Pro’ system (optional on the ML) allow you to select suspension height, locked centre diff and locked rear diff. At maximum ground clearance of 307mm and with the rear diff locked you are restricted to 30kph. This system works very well indeed. So well that an off-road route playing follow-my-leader down a river was like a walk in the park. The accelerator pedal allows you to adjust your speed very finely or keep to a constant speed, which is often best policy while fording rivers. 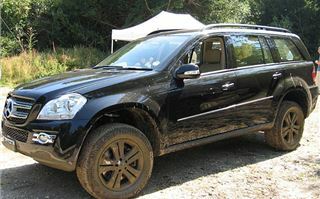 Despite being fitted with Dunlop Grandtrek AT2 M+S tyres, the car handled very decently indeed for a big 4x4 on the road. Communicative steering, MB’s heavily sensored ‘Dynamic Handling System’, and the 7GTRONIC shifter enabled it to be hustled along at serious speeds (we saw 200kph in the 500), or simply cruised at a comfortable 120-130. Though obviously the new 420CDI is the engine of choice, the 320CDI does the job more than adequately and doesn’t ever feel underpowered in the manner of the 2.7TDV6 in the Discovery 3 or Range Rover. And you can justify it to Ken Livingston on the grounds it’s a bus, capable of carrying 7 people comfortably, while delivering far lower emissions and much better fuel economy per person than a 40 seater bus containing 7. 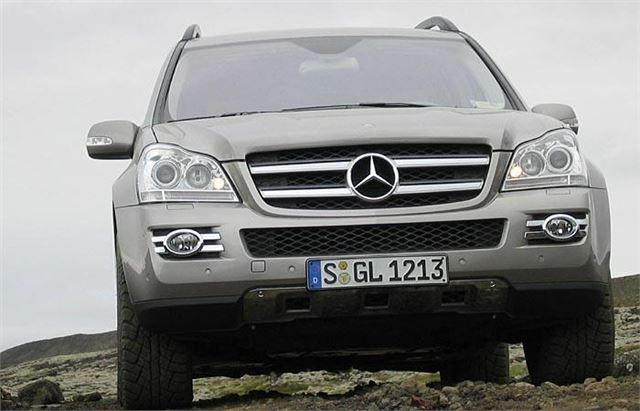 Despite the GL’s bulk I preferred it to drive both on and off road to the ML. But there is a visibility problem when reversing. The big mirrors alone and the reversing beepers just aren’t enough. 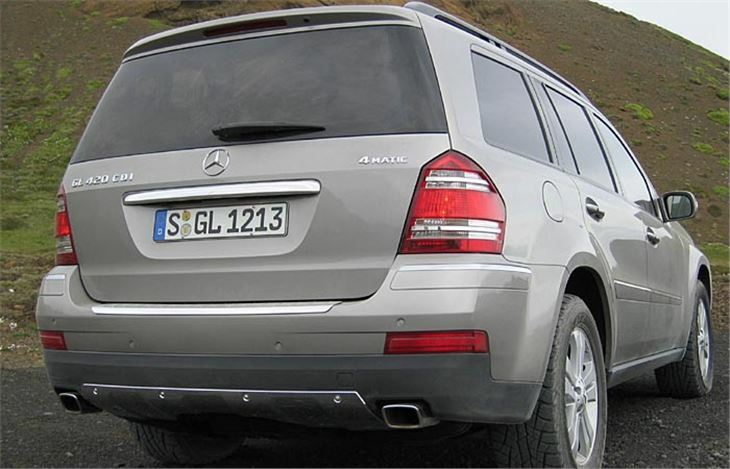 It really needs the PARKTRONIC reverse park assist system with reverse parking camera as on top versions of the XC90. 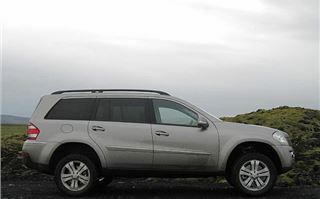 Despite being capable of carrying six to seven people and their luggage 800 miles in a day, crossing deserts, fording rivers, climbing mountains and whatever, or towing a boat or a large caravan, some GLs will inevitably find themselves pressed into duty on the school run. And in all honesty, they’re a bit big for that. After all, the least thing you want to do is run over some green-envy protestor’s bicycle. Three weeks later I had a chance to get re-acquainted with RHD versions on UK roads and off them on a severe off-road course. Only the GL420CDI and GL500 were available on this occasion, and on UK roads there’s not much difference between them in performance terms. Surprisingly, the 500 is slightly more fussy, needing to change gear more frequently to sustain the same sort of pace. The size is no impediment, as they seem to shrink around the driver and corner very nimbly. I preferred the driving experience to the R Class, though it has to be added that the R Class I drove was only a 320CDI. Off-road we had ample opportunity to try all modes of the Off-Road Pro system, employing the highest suspension setting, low range gears, centre and rear diff locks and manual gearchange as appropriate. It took everything the course could throw at it, seemingly with distain. 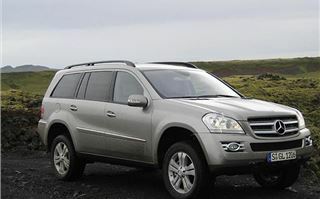 And the cars we used were the same GLs we drove to and from the venue, all on Pirelli Scorpion M+S road tyres that both plugged through the mud and were pleasantly quiet on the motorway. 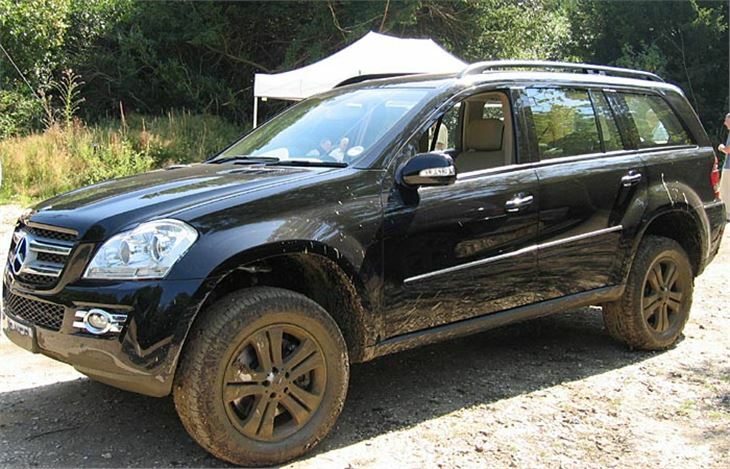 It may be huge, but the GL is currently the biggest and best SUV on the UK market and the only one capable of carrying seven for long distances in comfort. It pips even the Discovery 3 at that job.